Designed entirely in the cloud from the ground up, BlackLine is the only unified technology solution built specifically for accounting and finance. No messy acquisitions, no disparate hybrid software-hardware combinations, and no expensive middleware or upgrade costs, just the world’s most trusted solution for Finance Controls and Automation. The simplicity and usability of BlackLine solutions are unique. Unlike some systems on the market today, BlackLine is not a Frankenstein patchwork of old software and hardware. Rather, it’s a comprehensive Finance Controls and Automation platform built on a single codebase and delivered securely via the cloud. Users enjoy a consistent experience with single sign-on and avoid constantly switching between multiple systems. Data is available between products within the platform as well, without having to be transferred between or through other systems. Organizations can manage the entire accounting and finance lifecycle and gain a global view into tasks and processes, all in one centralized, secure, and reliable system: the only unified cloud platform built specifically for finance and accounting. When clients purchase BlackLine, they focus on adopting the technology for process improvement rather than supporting its infrastructure. BlackLine helps organizations modernize processes, embed controls, and obtain unprecedented visibility into accounting and finance by centralizing key accounting functions within a single platform. In addition to automating period-end processes, BlackLine solutions enable companies to move beyond the antiquated record-to-report process to a new approach known as Continuous Accounting. This evolution of process optimization and technical automation facilitates continuous monitoring for fraud and inaccuracies, delivering greater visibility to the organization and unleashing accountants to contribute greater value to the broader business. Advance critical accounting operations and centralize account reconciliations, journal entries, variance analysis, intercompany transactions and processing, task assignments, checklists, and the financial close with BlackLine. BlackLine Finance Transformation solution centralizes the management of all period-end close activity and streamlines accounting workflows, general ledger reconciliations, journal entry management, and other period-end processes. It enables the timely completion of financial and regulatory reporting and ensures simplified auditability. Trust in the accuracy of your financial reports with a controlled and transparent close process. BlackLine Accounting Process Automation solution is designed for organizations looking to innovate and optimize their record-to-report process. It covers the full reconciliation to adjustment process, allowing for transactional process automation through configurable matching rules with automated clearing of items. This enables organizations to take their operations to the next level and focus resources on strategic analysis, not transactional monotony. Specifically designed to orchestrate and accelerate the close, BlackLine Close Process Management provides tools that work in unison to help manage and execute the “last mile of finance”. By embedding controls and standardization in reconciliation and period-end close processes, BlackLine becomes a configurable, web-based command center from which you can manage accounting and finance tasks and monitor the end-to-end close process. A critical internal control over financial reporting, the account reconciliation process creates a foundation for organizations to evaluate business performance and support strategic decision making. The BlackLine Balance Sheet Integrity solution standardizes and automates your general ledger, bank, credit card, cash, and other operational reconciliations to streamline and control close cycles and ensure the integrity of your financial statements. The BlackLine Intercompany Hub provides a clearinghouse for intercompany transactions that eliminates after-the-fact manual intercompany reconciliations and settlements. It interfaces with a company’s core ERP systems and manages all of the global complexity inherent to intercompany accounting. Stop sacrificing control and wasting time and resources on these challenges and centralize the process from end-to-end. BlackLine Smart Close for SAP enables modern finance organizations to make the best use of their resources and be more strategic by automating, simplifying, and standardizing the financial close, directly within SAP. Your organization gains the confidence of improved balance sheet integrity and automated, audited processes that improve productivity and controls. It’s Robotic Process Automation for the Financial close built directly in SAP. Many companies offer products to support accounting and finance functions, but most solutions are cobbled together from hardware and different software systems not originally engineered to integrate with each other. Not all systems are created equal. There are complex issues with customization, service packs, version control. Stop fighting with poorly integrated software. There’s a better way. BlackLine is an entirely cloud-based, comprehensive accounting system that is a single solution. Whether users are preparing account reconciliations, adding journal lines, executing tasks, or running reports, their experience is consistent. BlackLine was built organically on a single codebase, meaning every component of the platform is naturally integrated and designed to work with the rest of the platform. With multiple major feature additions a year, high-availability up-time, and a highly secure data model, BlackLine’s unified model delivers consistency and reliability, and enables accounting teams to focus on process improvement and best practices. The difference is clear. BlackLine’s vision is to modernize the finance and accounting function to empower greater productivity and detect accounting errors before they blow up into a devastating financial restatement. BlackLine is the leader in Enhanced Finance Controls and Automation (EFCA) software and the only provider that offers a unified cloud platform supporting the entire close-to-disclose process. BlackLine enables clients to move beyond outdated accounting processes and point solutions that help accountants and finance professionals work smarter and more efficiently. 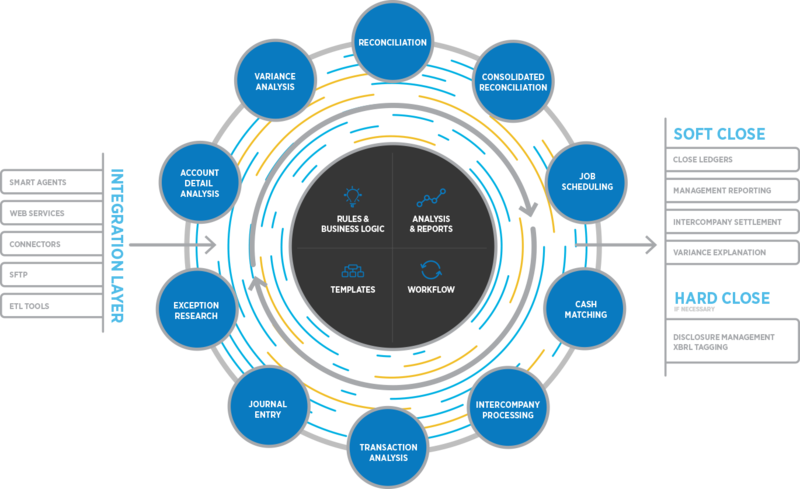 The accounting and finance departments of more than 2,600+ worldwide clients currently leverage the unified BlackLine platform to perform mission-critical processes in near real time — including financial close, reconciliation management, journal entry management, intercompany transaction management, and controls assurance. The BlackLine Finance Controls and Automation platform helps midsize companies and large enterprises by filling in the gaps left by ERP and CPM systems and thereby strengthening controls, lowering compliance risks, and introducing greater efficiencies and visibility into every step of the accounting process. BlackLine’s Modern Finance platform delivers a fresh approach that increases the quality, accuracy, and efficiency of the financial close process and other period-end activity. This new approach, known as Continuous Accounting, embeds automation, control, and tasks typically not performed until the period-end directly within day-to-day activities, allowing the rigid accounting calendar to more closely mirror the dynamic nature of actual business cycles. This not only more evenly distributes workloads over time, but also enables continual monitoring for errors, fraud, and unusual fluctuations. BlackLine’s unified cloud platform empowers accounting and finance teams to automate period-end activities and to drive continuous accounting processes across their organization. BlackLine is the only technology available that enables an efficient and accurate process and provides real-time reporting and analysis.